Mention string tension to casual players and they are likely to give a derisive snort and question why anyone wants to take sport so seriously. But what they are failing to consider is that even for less talented or dedicated players paying attention to tension can lead to improvements in their game. This, in turn, means they will enjoy their time on the court so much more. After all, everyone likes to win. So let’s take a time out and, at the risk of soliciting a few stifled yawns, talk tension. Look at the frame of your racket. 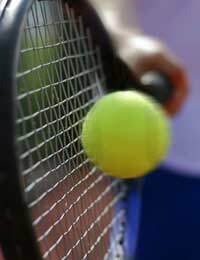 On it you will find the manufacturer’s recommended tension for obtaining maximum performance from the racket. This figure, expressed in both pounds and kilograms, serves as a guide. It will be based, in part, on the size of the racket head. Why? Because the larger the head, the longer the strings will be, and the longer the strings the tighter they will have to be in order to obtain the same performance as the shorter strings found a smaller head racket. Still listening? Well that’s the most technical part of the lesson over with. Now let’s see how this tension translates to match play. The less tension applied to the strings, the looser they will be. As a result, a greater amount of power will be available because, as the ball makes contact with the racket head, the strings will bend back before firing the ball back and out of the racket face. Looser strings will also reduce the impact felt in the racket arm and shoulder. By contrast, the more tension, the tighter and flatter the strings will be, which means the player will have more control over the ball on the racket. He or she will be able to impart a greater amount of spin, too. The constant impact of ball on strings will result in a gradual loosening of the tension. This is why you will find serious players taking a number of rackets on court with them so that during a long match they can use a new one when they feel the strings of their existing racket becoming too loose. As you become a better player and build on your individual strengths, you will become more aware of choosing a string tension that corresponds too those strengths. That’s when you will need the expertise of a stringer, many of whom will have their contact details held by local clubs and sports shops. Many offer mail-order services. Such is the valuable supporting role that they play in racket sports that national and international associations exist to both promote the craft and support members. There is the UK Racket Stringers Association, for example. Further afield, the European Racket Stringers Association and the equivalent association covering the United States is Racquet Tech. All these bodies offer contact details for individual members in your area. Some even offer stringing lessons for those who want to take a greater interest in the process. The vast majority of players, not surprisingly, will be more than happy to leave it to the experts. But even the most rudimentary knowledge of the science behind string tension can be valuable in adding an extra dimension to on-court performance.